We offer a full range of Temple Terrace property management services tailored to you as an investor, homeowner, or landlord. We have an extensive portfolio of single family homes, townhouses, condos, and apartments in the Temple Terrace area. Incorporated in 1925, Temple Terrace was named for the then-new hybrid, the Temple orange. The Temple orange, which is also called the tangor, is a cross between the mandarin orange — also called the tangerine — and the common sweet orange; it was named after Florida-born William Chase Temple, one-time owner of the Pittsburgh Pirates and founder of the Temple Cup. Chase was also the first president of the Florida Citrus Exchange. Temple Terrace was the first place in the United States where the new Temple orange was grown in large quantities. The "terrace" portion of the name refers to the terraced terrain of the area by the river where the city was founded. One of the original homes also had a terraced yard with a lawn sloping, in tiers, towards the river. Temple Terrace is redeveloping 50 acres (the southeast quadrant) of its 1960s-era downtown to build a mixed-use, medium-density, pedestrian-oriented center. The site of the new downtown area is the site of the area that was originally planned in the 1920s but never built because of the Great Depression. Many of the planning concepts and architecture of the redevelopment area are based on the original plan and Temple Terrace's unique 1920s historic Mediterranean Revival architecture. 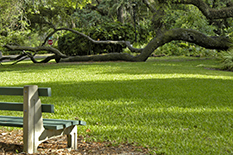 Known for its rolling landscape, bucolic Hillsborough River views, and majestic trees, Temple Terrace has the most grand sand live oak trees of any place in central Florida. 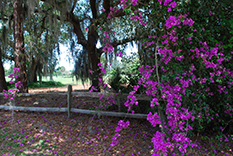 Temple Terrace Golf & Country Club is one of the oldest golf courses in the Tampa Bay area. The golf course is named on the National Register of Historic Places and is the only 18-hole golf course in Florida with that designation. One of the first private golf courses in the Tampa Bay area and designed by renowned architect Tom Bendelow, Temple Terrace Golf & Country Club has been the centerpiece of the community since 1922.